That seems to elicit more “oohs” and “aaahs” than the explanation itself. Because it neatly wraps up all of the advice in a nice little let-you-off-the-hook gift. See, if you’re really great at accents, and characters, and foreign languages, great. Use them. But don’t use them in a way that calls attention to them. Don’t push them out in front of the story itself. Don’t show off your mad dialect skillz. Voice them in the vast sea of your straightforward English “neutral narrator” voice (or whatever your native language is), at an appropriate energy and pace, so that they meld nicely with the rest of the story. And it’s OK if you don’t do accents and dialects well. Don’t try too hard. Nod at them. Tip your hat at them. Just be authentic with the story. The story will save you. The writing will be your biggest ally. 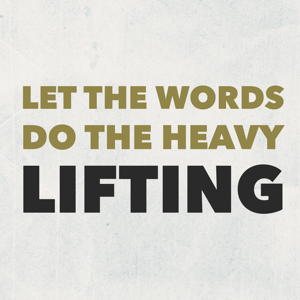 The words will do the heavy lifting…if you let them. When narrating an audiobook, let the words to the heavy lifting. Your performance should always be in support of the words the author has written. Don’t get out in front of the story by showing off, say, your ability to perform a perfect Mongolian (Eastern Mongolian, actually) accent. Use your energy to serve the story. Use your efforts to keep the listener engaged in the story, not aware of your performance. 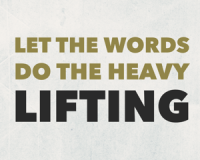 If you let the words do the heavy lifting, your performance will be ultimately engaging and satisfying to both you and to the listener. Thanks David, I was wondering about all of the sound effects and things. I don’t like it either. I was just recording an audition with a British accent and…I’m going to redo it. The author said he’s open to any accent. I think I’ll keep mine. Even those who have a penchant for accents should be careful in their use… listeners, whether fairly or not, will often surmise a fictitious attempt at accented dialog. Having been raised in the U.K., and Canada, with time in the Far East and permanent residence in the U.S. in all sections of the country, such as afforded me the ability to speak using a variety of accents. I avoid them as much as possible to negate any perception by the author or the audience of not being the genuine article, unless the creator of the work has specifically requested such pronunciations as part of the project. Right on David. There a few that I enjoy doing and can do without getting in the way, but I will proceed with caution. Very well put. Thanks David. It helps and confirms. David…I avoid accents because I don’t do them well. Nothing more painful than hearing some reader struggle with an accent they shouldn’t even be doing! Agree with you, too about music/sfx. As narrators, we are showcasing the words of the author. Also, audio book recording is so labor intensive, adding music/sfx would take even more time and probably for no additional compensation! Finally, I love your thought about letting the words do the heavy lifting. Years ago, a production guy told me to “read it like you just don’t care”. Coming from over 3 decades in radio, that is still my biggest challenge! An actor’s job, whether stage, screen, TV, or mic, is to advance the story without causing distractions, period.